The second location of the New York-style deli opens Monday. Here's what you'll see. 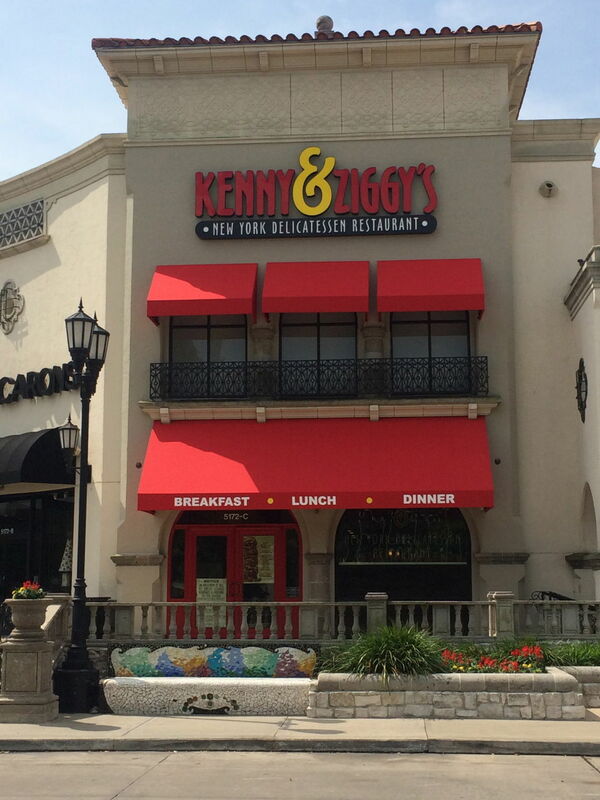 On Monday morning at 7 a.m., the new West University location of Kenny & Ziggy's New York Delicatessen will open to the public at 5172 Buffalo Speedway. 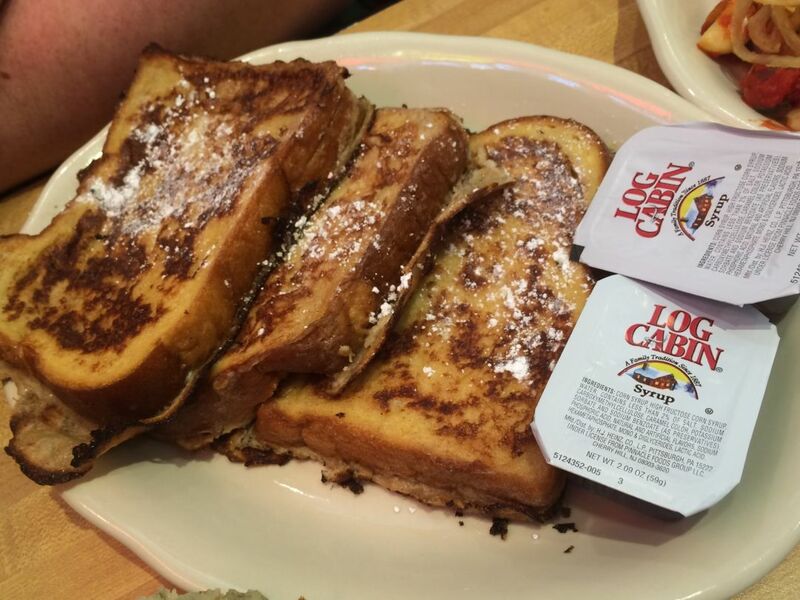 More than likely, diners will be lining up for something like this. Houstonia was treated to a soft opening meal on Saturday that revealed pretty much what we'd hoped: The menu at the new restaurant is nearly identical (and equally massive) to the original Post Oak location, complete with signed musical theater posters, photos of the Three Stooges and a densely packed case of desserts and deli classics such as smoked fish and knishes. 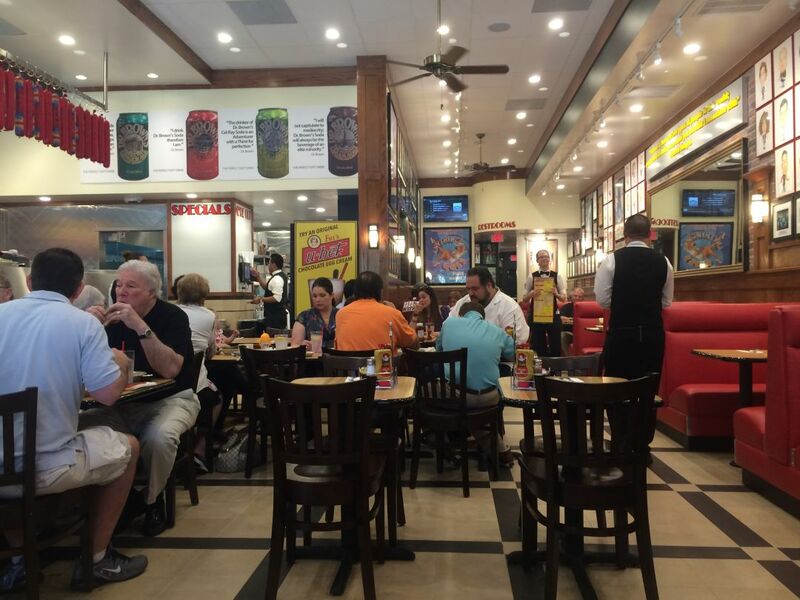 More notably, the smaller location (2,500 square feet, in comparison to the 7,500 square foot flagship) makes the restaurant feel more like the crowded New York delis it seeks to approximate. Order an egg cream, won't you? 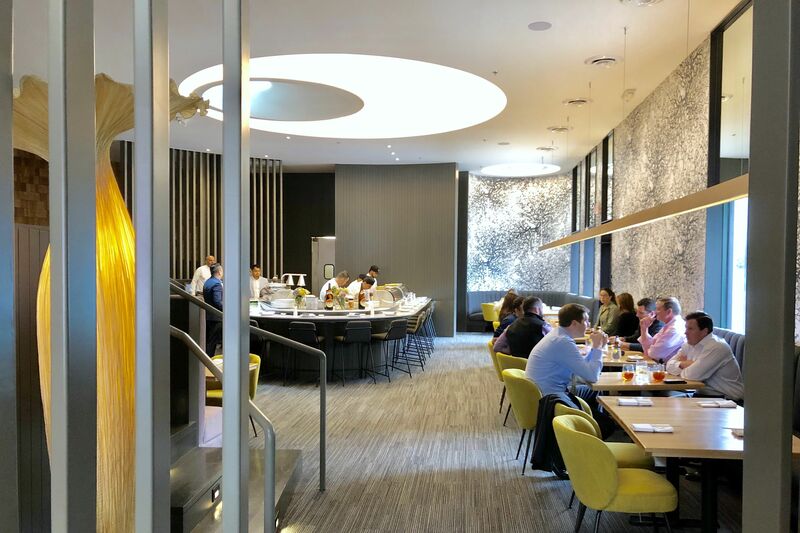 On Saturday, the kitchen was still finding its footing ahead of opening, so diners were brought whatever dishes the staff needed to practice. 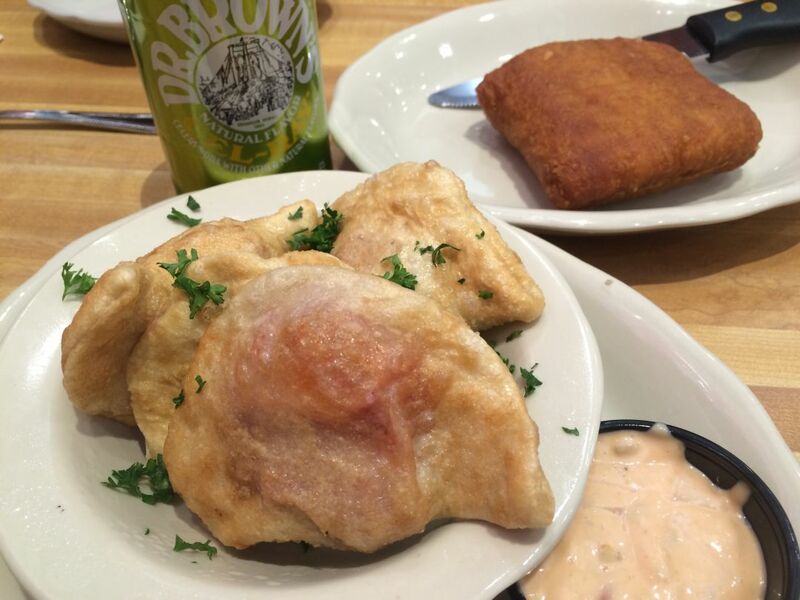 Reubies, $11.95; homemade knish, $5.95; and a Cel-Ray, courtesy of Dr. Brown. 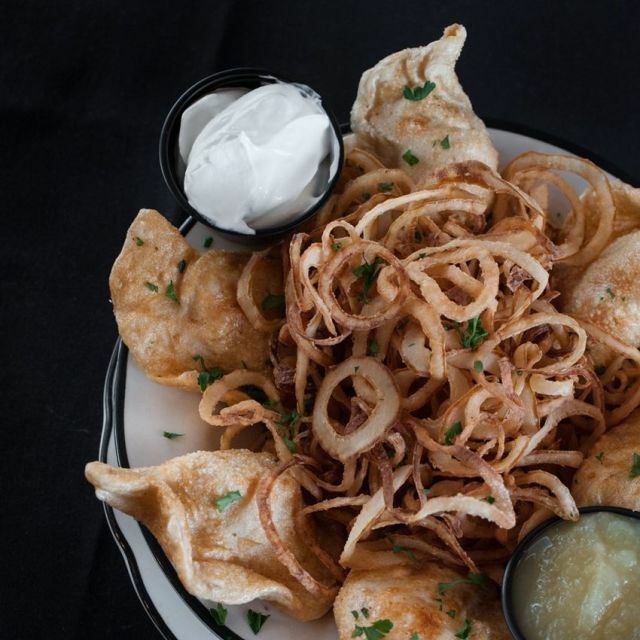 In the case of my party, that meant an onslaught that began with Reubies—basically fried pierogi stuffed with potato and corned beef and served with Russian dressing for dipping—and looked like it may never stop. Not that there's anything wrong with that. Crispy chicken with cilantro ranch, $16.95. The beauty of the variety was that we got to try dishes we never would have thought to order, but that, even when the crew was still learning, sold us on future orders. 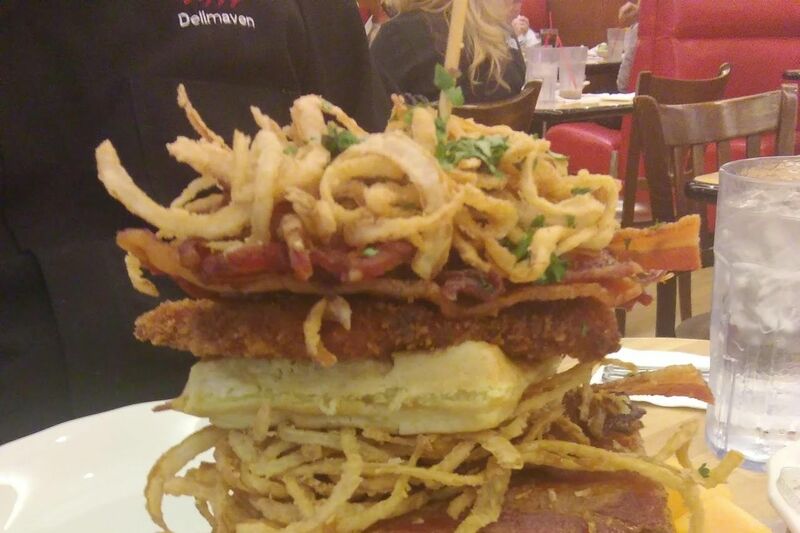 The crispy chicken sandwich is far more ambitious than it sounds: In Jewish deli fashion, it's comprised of three layers of chicken schnitzel served on a challah-style bun. For a taste of Texas, there's bright cilantro-ranch dressing on the side. Grilled Mediterranean tuna, juicy and tender at our requested rare, is blanketed in a chunky sauce of Roma tomatoes, onions, basil and whole caramelized garlic cloves. 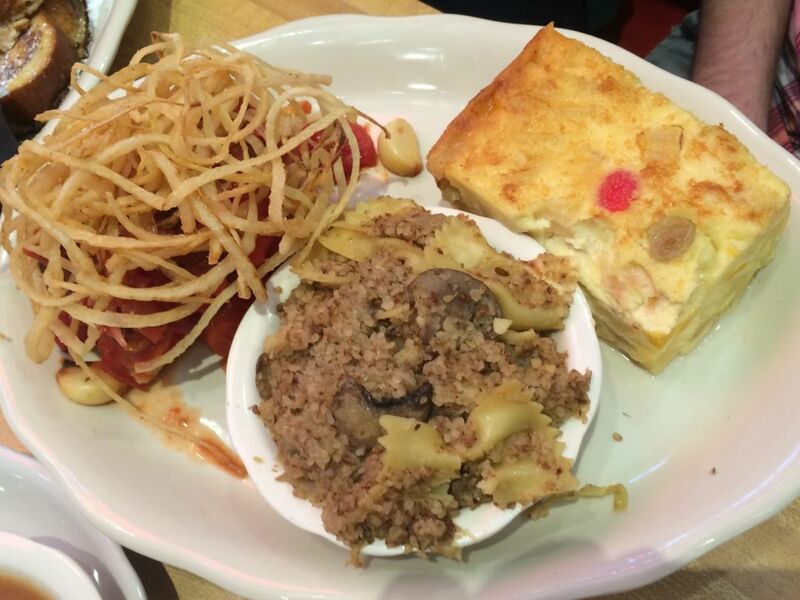 We couldn't help but ask for sweet kugel and kasha varnishkes on the side in order to make things a little more semitic. One of my companions even ordered his first ever egg cream (and the first our server ever mixed) to accompany the meal. Fiddler on the Roof of Your Mouth, $18.95. When our server presented us with the handwritten list of what we'd be eating, one item was simply identified as "#1." 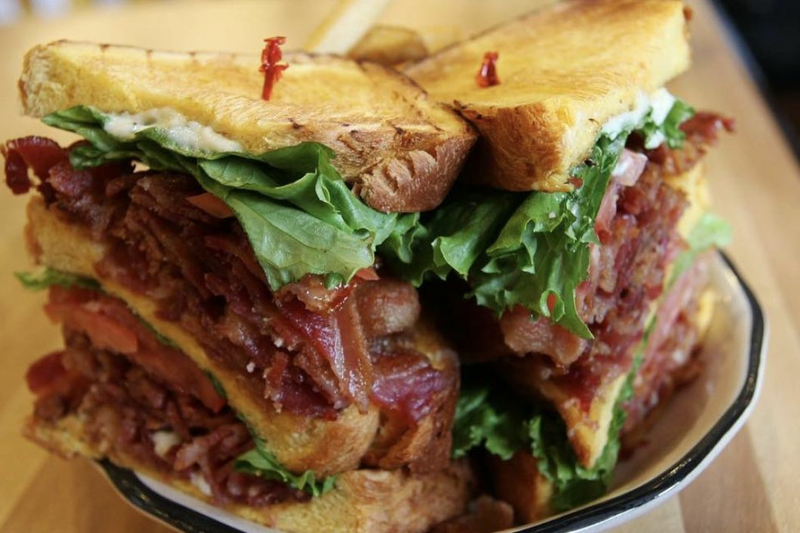 That turned out to be the first sandwich listed in the oversized "Sandwich Stars" section of the menu, the Fiddler on the Roof of Your Mouth. 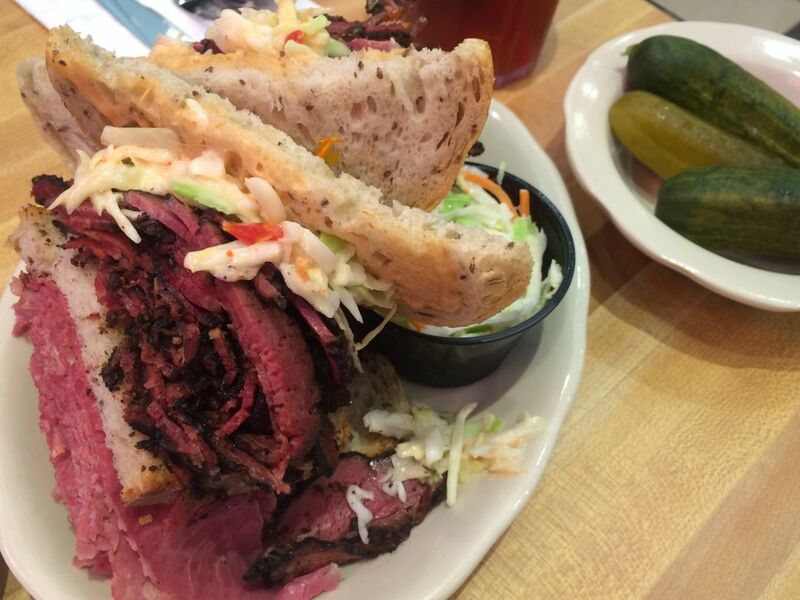 The triple-decker tower of meat includes both corned beef and pastrami (made in-house, of course), with Russian dressing and coleslaw on seeded rye. To the New York Jew writing this post, it was a gustatory journey home. 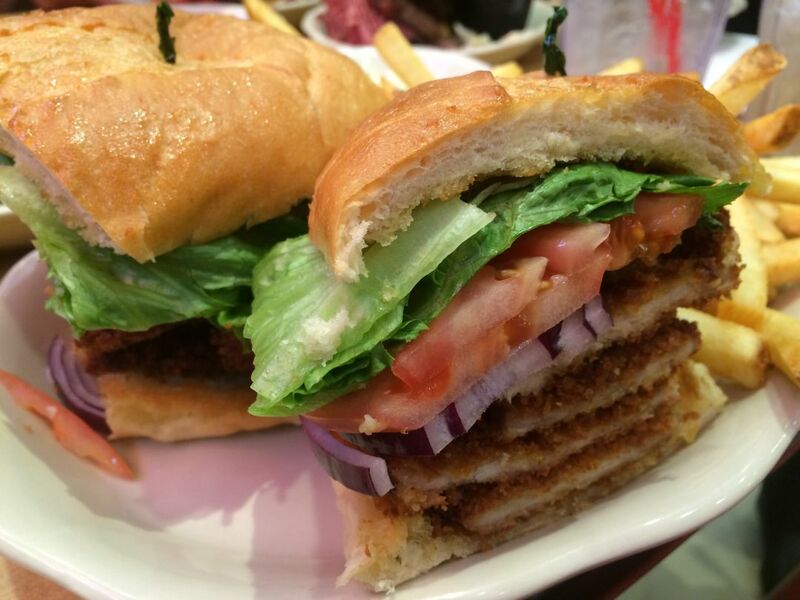 For anyone else, it's just a satisfying sandwich that's too tall to fit in your mouth. 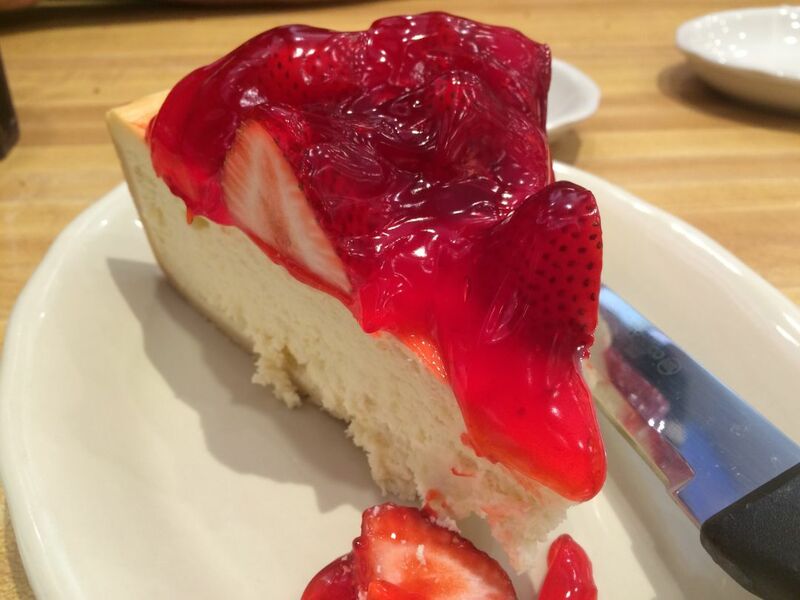 And that homemade cheesecake at the end of the meal? Well that was just the cherry (or in this case, strawberry) on top. May there be many more gluttonous days to come for Houston's second coming of the deli messiah. 5 B.L.T. Sandwiches You Can't B.E.A.T.